As the Irish 10 km Championships were also being held as part of this year’s Water Festival, I decided to make the effort to travel up. I left my home in Fermoy in the afternoon and settled in for a long drive. To my surprise, I was crossing the border less than 3 hours later and it was only another 15 minutes to the lake – the joys of traveling on Ireland’s new and largely empty motorways! It was 6:00 pm when I arrived and the last even of Day 2 of the Water Festival, the Try-a-Tri, was just about to start. The set-up at the lake was very impressive, with swimmers being funneled into the finish by two swimming pool lane ropes and finishing by slapping overhead touch-pads as is done at all of the major international events. The safety operation was also top-class! After a good night’s sleep, I made my way to the lakeside for registration at 11:00 am. There, I met Jon and Jamie Glover and their dad, Michael, who had travelled to Fermoy for the Irish Long Distance Swimming Party last November. 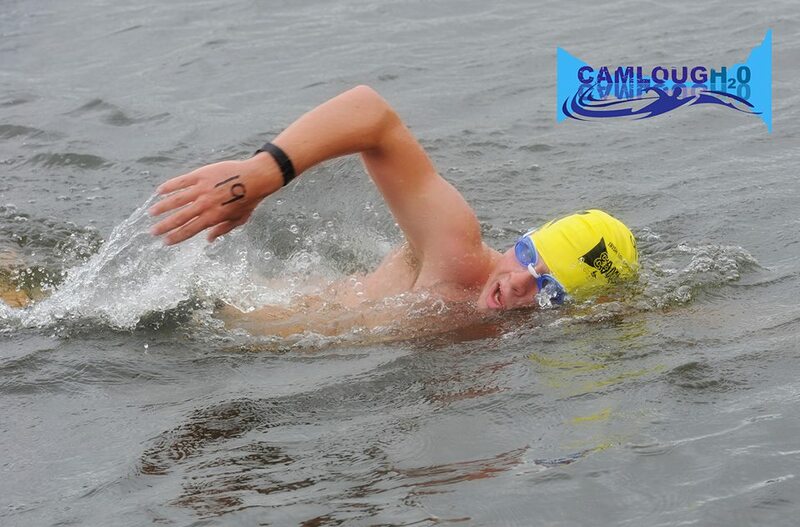 Jon would be doing the 10 km, his first swim of this distance, and Jamie would be doing the 5 km. I also met Stephen Kelly and Warren Roche from Waterford. Stephen did a 10 km in the Blackwater in Fermoy about a fortnight before and would be swimming in a wetsuit while Warren, whom I had narrowly beaten at GaddinAbtGarnish in June, would be racing the 10 km in skins. 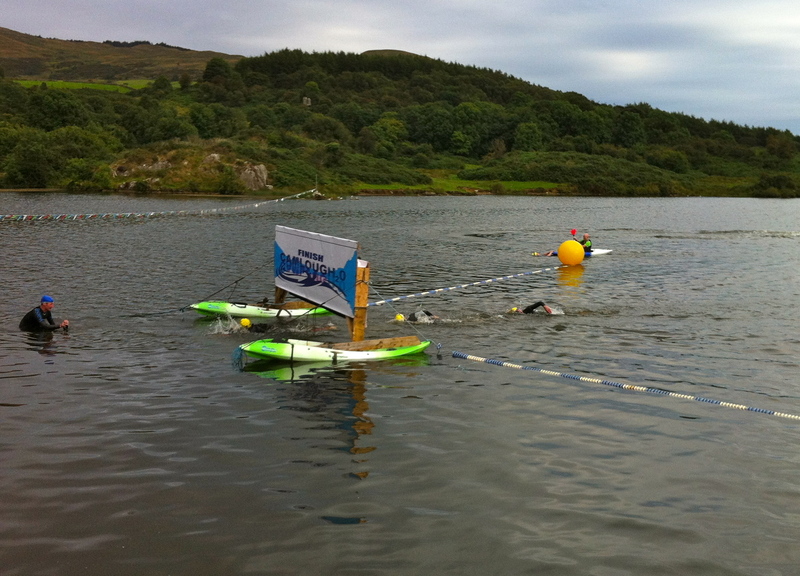 Once we were all changed and had handed in our feeds to be taken to the feeding station, Pádraig gave the swim briefing: the course would be very simple – two 5 km laps of the lake (with the feeding station being at the far end). 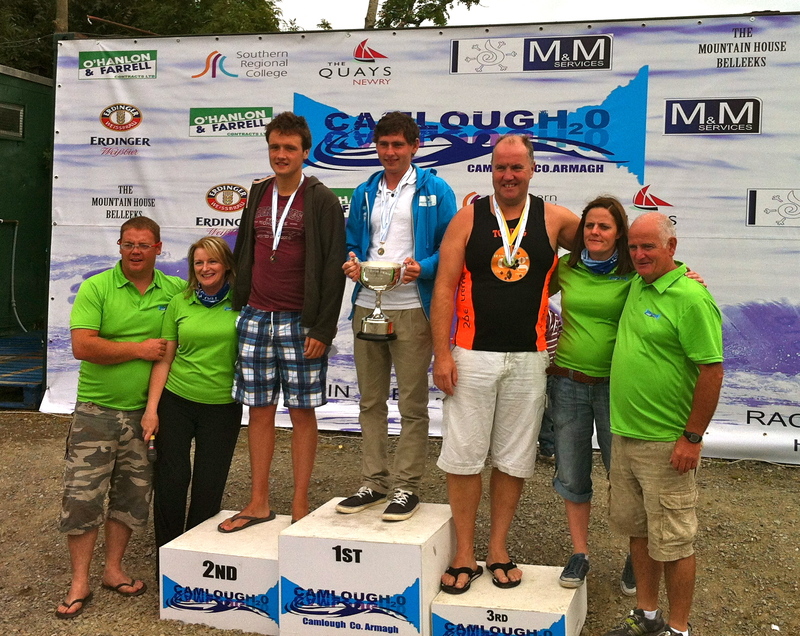 Pádraig then made sure that everyone in the skins category met the suit and cap regulations so that the event had the integrity expected of a national championship. Once everyone was ready, the klaxon sounded and the race had begun! Around the next buoy, Warren was out of sight, Lisa had about 50 m on me and Alvaro was passing me. However, I slowly began to gain on Lisa. There was no point in worrying about Alvaro; we were in a different race. I caught up with Lisa as we neared the bottom of the lake and I could see by the trees on the shore that we were moving along at a good pace. This time, we did stop at the feeding station and I had my liquid feed. Lisa got away a bit faster than I did so I had to do a bit of work to catch her back up again. We settled into a good pace going up the lake and I just paced myself off Lisa (and accepted that Warren had the race won). There was a big tree marking about 500 m from the finish so I stopped to have another gel (this time with caffeine) for a final sprint to the finish: it was well worth the few seconds to stop and have the gel! I steadily pulled away from Lisa and, as the finish came into view, I noticed Warren on my left. I started sprinting, passed him and went all out for the touch-pad. At the finish, I threw my right hand up to slap the pad as the timing chips were on our right wrists and walked out. As we finished we each got warm cordial, a finisher’s medal and a multi-purpose scarf/hat/wristband thing, as well as our finish times, which for me was 2:28:29 – a new PB for 10 km! The podium for the Irish 10 km Championship race. Left to right: Pádraig Mallon, Patricia McParland, Warren Roche, me, Bill Donnelly, Aoiffe McCourt-Lynch and Myles McCourt. Lisa and Warren finished about 45 seconds after me and the other swimmers came in in dribs and drabs over the next hour and a half. Once the last swimmer was in, the presentations were made. I was delighted to not just be on the podium, but to be the Irish Champion for 10 km for 2013. I never expected that, especially just a week after my longest swim ever! I came home that evening with two trophies, two medals, a wooden plate, the finisher’s prize and an Amphibia X-Bag. I had a fantastic weekend at the Camlough Lake Water Festival and would highly recommend it to anyone. The bar has been set very high for other event organisers with this one!